A Sticker book for filling time while waiting in the car or hanging out at our condo. 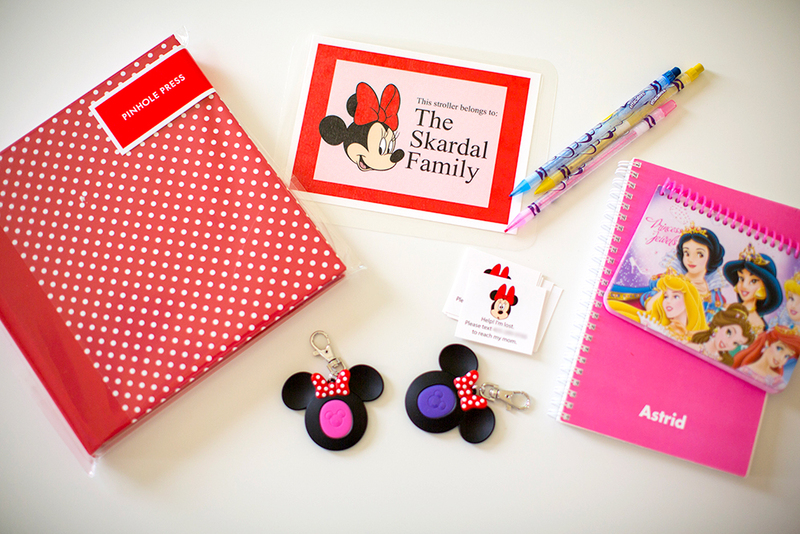 Some “Tinkerbell” gift bags to fill with small daily gifts for the girls. “I’m Lost” stickers. When my sister and I were kids, my Dad once lost my older sister at Disneyland and we never hear the end of that story from my Mom. So I thought of creating small stickers with our contact information that the girls could wear and point to in case we lost them. Disney staff deal with lost kids often enough that they have a system for helping those kids reconnect with family, but a little sticker with my phone number would give me a little peace of mind. A stroller label (added to a full photo on a single greeting card and laminated locally). Any other time-filling activities on the Arts & Activities page. There is no shortage of waiting time at Disney World– driving time, waiting in line, waiting for dinner reservations, waiting for everything! So I considered products like the Half & Half Picture Pad, Story Starter Memory Book, and Photo Scribble Pad since my older two are happily occupied by coloring and drawing for large periods of time. Ultimately, I ordered sticker books for each kid, “I’m Lost” stickers, and a single individual greeting card to use as a stroller label. We packed up and left on a Saturday in early December, and drove 9 hours to Orlando with my husband, 4-year-old, then 2-year-old, and then 7-month-old, while my parents and sister flew from Chicago to meet us there. We stayed off-site in a villa and headed to parks for 5 days: 2 days at Magic Kingdom, 1 day at Epcot, 1 day at Animal Kingdom, and 1 day at Hollywood Studios. I could be in many of the photos. I didn’t have to tow around my nice camera, along with every other thing in our double stroller. Our group could split up and photos could be taken at the same time while we visited different characters or rides. We did this while I took the baby to visit Chewbacca, and the rest of the crew met with Pluto, Princess Sofia, and Jake the Pirate. The sticker books I bought were a hit, plus they kept the girls busy during downtime. The stroller label was great for finding our double stroller in the sea of strollers at every ride. Luckily, no one was lost on our trip, so the “I’m Lost” stickers didn’t need to be used! I wish I had ordered a personalized autograph book for my 4-year-old, since that ended up being something she really loved carrying around for character autographs and doodling. I also knew I wanted to create a photo book for my parents. I included photos downloaded from Memory Maker and a handful of my cell phone photos to create a Square Layflat Photo Book with Classic Font. But any of Pinhole Press’ photo books are a great option to commemorate a trip. My mom also likes the Pinhole Press photo magnets, so I picked out 12 of our favorite photos from the trip and had those printed and sent to her as a Christmas gift. We might also create a framed print from our collection for a future Mother’s Day or Father’s Day gift. Overall, it was a great (and exhausting!) trip to Disney World. I’m so glad we have a nice photo book to celebrate the trip with, and I look forward to printing more products with our photos. I’m so happy I was able to gift a special photo book and magnets to the grandparents so they can remember our trip fondly.